The SFEI Environmental Informatics Program utilizes the latest technology and design concepts to deliver scientific information to a wide range of stakeholders in dynamic, expressive, and cogent ways. Web-based tools, such as EcoAtlas, California Rapid Assessment Method, and Contaminant Data Display and Download, form a lynchpin of SFEI’s success as a communicator of timely and salient scientific information. Our Geographic Information Systems team rigorously describes and analyzes the world as it is, as it once was, and as it could be. Our Data Services team, forming the core of SFEI’s Regional Data Center, offers a suite of analytical services for the Bay RMP, the California Environmental Data Exchange Network, and various local agencies and programs. Using innovative data visualizations, our Application Development team produces tools that integrate disparate data sources to serve the needs of decision-makers and the public. Our Design and Communications team provides the bridge between science and its intended audience through creative and thoughtful methods. Our Systems team ensures the Institute’s computing infrastructure is robust, secure, and accessible to meet the growing requirements of our databases, websites, and tools. The Environmental Informatics Program is unique among the programs and departments at SFEI, in that it has a dual role. The first role is to provide the basic computing infrastructure and technical support necessary for any functioning organization; the second is to seek opportunities to apply information technology to promote informed stewardship of the Estuary, both for SFEI and for groups outside the Institute. SFEI’s Environmental Informatics team, working in collaboration with its scientists, explores the frontiers of geodesign and alternative future planning, and facilitates discovery to inform decision-making at all levels of natural resource management. For additional information, please contact Program Director Tony Hale or Program Manager Cristina Grosso. Geographic Information Systems, or GIS, is a powerful dynamic tool that allows complex analyses to be applied to the landscape. The department uses this technology to create practical tools that support better decision-making and promote smart solutions for environmental problems. Our technologists work in concert with SFEI’s scientists and project managers to reach a wide array of audiences. We collaborate with such people and organizations as local landowners, city and county governments, California Regional Water Quality Control Boards, as well as other science based institutes and organizations, all to forge the connections necessary to inform accurate, useful and relevant GIS analysis and tool creation. .
One of the department’s distinguishing characteristics is the strength of the wetland mapping expertise. In order to protect and conserve the sensitive wetlands across the state of California, aquatic features must be cataloged and analyzed in a comprehensive and detailed database. CARI, an amalgam of a number of intensive regional aquatic resource mapping efforts, is merely one prominent achievement for our mapping expertise. The Institute is often working on complex issues that have a broad impact for environmental sustainability on a regional scale. Such issues and ideas must be conveyed to different audiences in ways that are both visual and intuitive. Example environmental applications range from the Landscape Profile Tool, which allows users to summarize different environmental and social characteristics of custom areas of interest, to SFEI’s GreenPlanIT toolbox, which allows municipalities to create ranked maps of where future green infrastructure could be placed within their cities, using local priorities and datasets. SFEI has invested in novel, cost-effective solutions to costly problems. Most recently, our work with Unmanned Aerial Vehicles (UAVs) has yielded some very promising results. We have collaborated with colleagues at the Southern California Coastal Water Research Project (SCCWRP) to field test a UAV and apply it to a number of scientific challenges. In the course of this research, we have derived some useful analysis on the use of the technology. More on this intriguing research is available on our Unmanned Aerial Vehicle Project page. The Data Services (DS) team, forming the core of SFEI’s Regional Data Center (RDC), offers a suite of analytical services for the Bay RMP, the California Environmental Data Exchange Network (CEDEN), and various agencies and programs serving local and regional interests. The DS team helps organizations within the San Francisco Bay-Delta and northern montane regions prepare their data for regulatory compliance. The DS team also manages analytical data generated by staff scientists in support of SFEI programs and projects. Accordingly, the DS team specializes in managing data associated with a variety of environmental sample types including: analytical chemistry, ancillary, water toxicity, sediment toxicity, benthic assessment, habitat, pathogen, and continuous data. All data records are standardized using standard data vocabulary and business rules. SFEI’s Quality Assurance Officer and associated DS staff perform a thorough quality assurance and quality control (QA/QC) review of environmental results. Each dataset is reviewed for accuracy, precision, sensitivity, contamination and completeness. For more details on our services, please consult this reference. Over 2.1 million environmental data records are maintained by the DS team in SFEI’s RDC database. Data that has been approved for public release is disseminated through SFEI’s Contaminant Data Display and Download tool (CD3). SFEI is also a regional data center for CEDEN, the State Water Board's data system for surface water quality in California. As such, the DS team works to upload data for CEDEN clients throughout northern California. In addition to CD3, CEDEN clients can download their data through CEDEN’s Advanced Query Tool (AQT). Members of the Data Services team integrate with other Environmental Informatics focus areas by contributing to custom web programming and database design, programming and technology maintenance. The Application Development team is responsible for creating data visualizations and mapping resources that support the ongoing scientific efforts of the Institute. They innovate to bring the latest technologies to projects in service of greater efficiency, deeper impact, and more effective communication. Over the last 15 years, application development has gained prominence with successful completion of ambitious and meaningful efforts. These tools display not only data hosted and collected by SFEI and its partners, but also facilitate new mode of community interaction to promote broad-based data stewardship. As they collaborate with the science teams, the Application Development team creates a public face for our data and strives to provide accurate, understandable tools that are useful and informative for scientists, policymakers, and public stakeholders alike. The Institute's Design and Communications team exercises tasks vital to effective public information distribution. Our designers work closely with project stakeholders and collaborate with internal scientists and technologists to maximize impact for new tools, solve communications problems in project outputs, and lend a distinctive style to reports. Over the years, this talented team has come to define the look and feel of SFEI's most notable output. EcoAtlas, a tool for visualizing aquatic resources, has benefited from the work of the Design and Communications team. Furthermore, the Pulse, RMP's flagship publication, offers a visually compelling view on the Bay's status as the state's most critical estuary. SFEI's Information Technology Systems team forms the backbone of the technology productivity at the Institute. Through careful planning and coordination, they keep a complex network operating smoothly and facilitate continuous innovation through adaptation and renewal. Since 2008 a standard operating procedure for the development of software has been in effect. The SOP emphasizes fully planning software features and interactions in mockups and software specifications prior to initiating programming. This way, the programming task is well defined, costs and schedule can be better estimated, and all members of the project can align on needs and expectations. SediMatch is a web tool for matching restoration projects that need sediment with navigational and flood protection dredging projects and other "sediment suppliers" throughout the region to meet current and future sediment supply needs. Hale T, Sim L, McKee LJ. GreenPlan-IT Tracker. Bradt J. Richmond, CA: San Francisco Estuary Institute; 2018. Environmental Informatics. DEDUCE: Delta Environmental Data for the Understanding of California Estuary Factsheet. 2017. Azimi-Gaylon S, Hoenicke R, Grosso C, Hale T, Franz A, Ross J, et al.. Estuary-wide Data Repository for Delta Environmental Data to Understand a California Estuary Poster (2017). 2017. Azimi-Gaylon S, Hoenicke R, Grosso C, Hale T. Estuary-Wide Data Repository for the Delta Environmental Data to Understand a California Estuary. 2017. Azimi-Gaylon S, Grosso C. Visualizing and Aggregating Intensive Datasets to Better Understand Cumulative Effects. 2017. Hale T, Grosso C. An Introduction to EcoAtlas: Applied Aquatic Science. Richmond, CA: San Francisco Estuary Institute; 2016 p. 16 pages. San Francisco Estuary Institute. EcoAtlas: Enhancing Regional Capacity for Habitat Restoration Project Tracking, Assessment and Reporting. 2016. EcoAtlas - Lake Tahoe Environmental Improvement Program: Tool Integration White Paper. 2016 . Report No. : 800. Effective at Any Scale: Watershed-based Decision Support Tools. 2016. 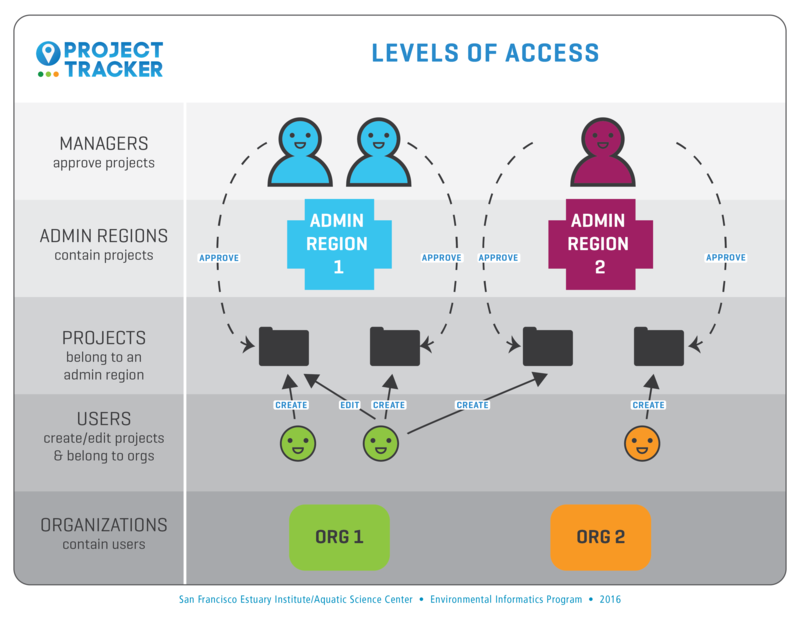 Grosso C. Project Tracker Access Levels - Graphic. 2016. Doehring C, Beagle J, Lowe J, Grossinger RM, Salomon M, Kauhanen P, et al.. San Francisco Bay Shore Inventory: Mapping for Sea Level Rise Planning. Richmond, CA: San Francisco Estuary Institute; 2016 . Report No. : 779. Wanczyk L, Hunt J. Carlos Street Rain Garden Interpretative Sign. 2015.